I have for some time now wanted to make my blog to look more izzywizz style instead of using a freebie premade template. Im soooooo passed that.....*lol* I have decided to join an online html and CSS (dont ask) blog course. Wish me luck! 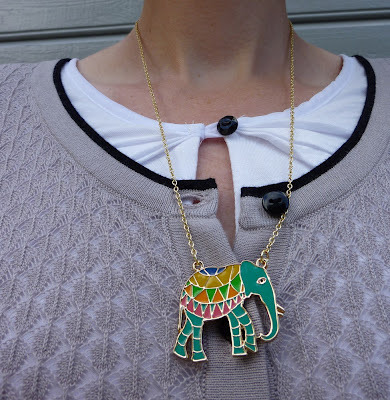 I adore elephant and owl jewelry too. 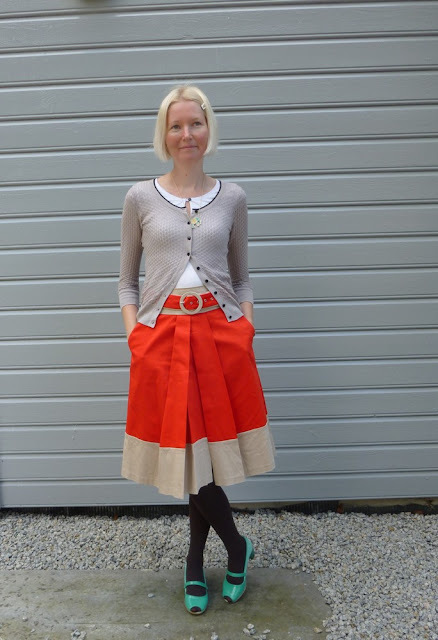 I'm loving this colorful, crisp skirt with the fitted cardigan top, and I am no way tired of your fabulous shoes : > Thanks for linking up with Visible Monday! Hi Izzywizz! The top photo of your amazing heels is fab! 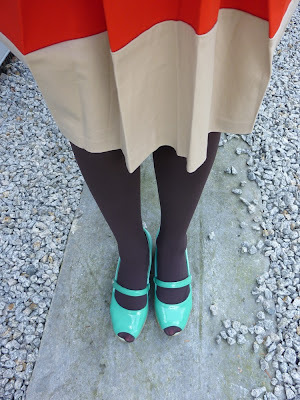 Very nice outfit and I would not get tired of your turquoise shoes even if you wore them in every single blog post. Have a great week! 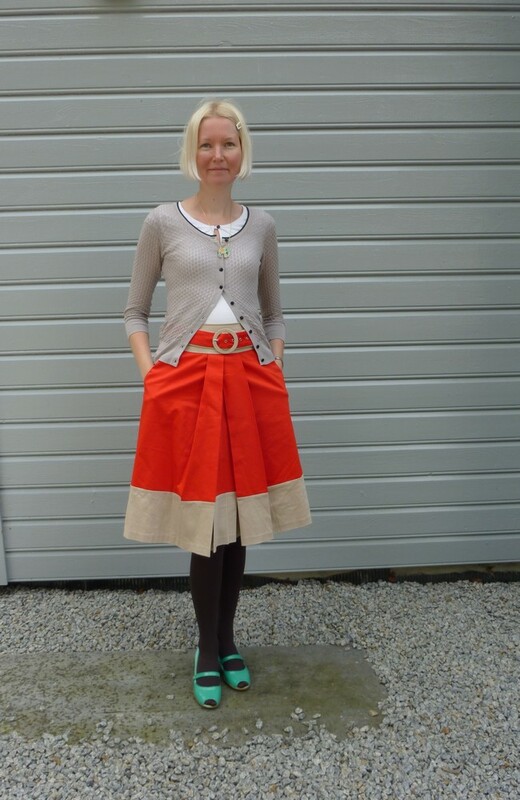 Love the bright orange skirt with those pumps! I'm not tired of them, they're fabulous. Goodluck on the blog redesign. I've tried fiddling a bit with mine, but I'm not up on coding enough. Hopefully I can convince my computer savvy SO to fix up my blog one of these days. Have fun with the re-design (I do like having the comment link at the bottom of the post, thank you!). I know enough HTML to play with things like tables in some of my posts, but just basic stuff. Oh, Im glad you are happy so far with my redesign. Yea the comment area was bugging me too, especially since the threaded commenting wasnt working with my other background/template. But now its all fixed! YaY! How cute is your elephant necklace! I love your bigger photos, brilliant composition, my gorgeous friend. You're doing so well, redesigning your blog! I'm studying web design, and I haven't bothered to practice my html-skills on my own blog. It really is too bad! Is it a Norwegian course that you've followed, or American? Anyway, you done great! Personally I never tire of those turquoise pumps, I can't get enough of them! They go so well with so much of your clothes - and they would go with even more in my closet! Oh, and the elephant is so cute! He can come too! YES! I wear a size 39, if they're wide enough! If she wears them a bit first, and then get tired with them, there's an even better chance that they'll fit ME! But if she starts wearing them she'll most certainly fall in love with them, and end up wearing them all the time - looking great! Anyway, thank you for just having the idea! Wow. You look elegant actually (which I thought was in the post title; clearly my reading glasses are not cutting it). You have the gift of combining very different items into a marvelous, cohesive picture. Funny, I was actually playing around with the elegant/elephant title but ended up not using it, I dont have a way with words when it comes to English. :P Oh such a sweeet comment, Thank You!